The Indianapolis Zoo is one of the highlights of our fair city and one of the first attractions we recommend to families new to the area. The zoo has a convenient downtown location, beautiful grounds, tons of interesting animals, and a family-friendly atmosphere. 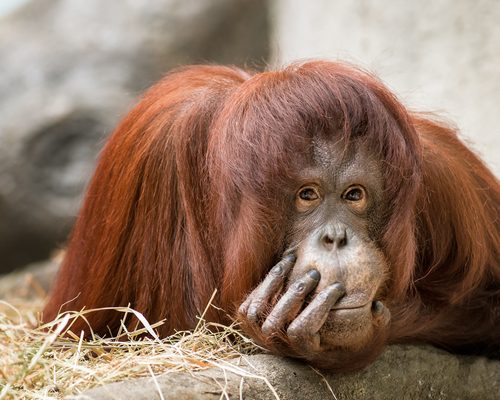 And since it opened in May of 2014, there’s another big reason to visit the Indianapolis Zoo: The Simon Skjodt International Orangutan Center! Here are some interesting facts about this one-of-a-kind exhibit. What makes the center so special? The exhibit was built to house a population of eight orangutans, one of the largest groups of these endangered primates in the United States. More than eight years were spent carefully designing a habitat that would stimulate their intellectual, social, and physical abilities while allowing them to display natural behaviors. What features does the exhibit include? Visitors are often amazed at how well they can see and interact with the orangutans. They can view the apes from many different observation points, including several where human and ape can check each other out face to face. There are many interactive exhibits, and regular presentations from zoo orangutan experts also help to educate visitors. The center is built around a three-level atrium with plenty of space for swinging and climbing. Around the atrium, a gondola provides a close look at the apes’ open-air environment, where they can climb ladders and walk high in the air along thick cables. Why is it called an “international” center? One of the main focuses of the center is on conservation efforts around the world and how visitors can get involved in supporting endangered orangutans. You can donate right at the zoo to efforts to reforest depleted rainforest in orangutan home ranges in Borneo and other locations.